Throughout this blog, I have been trying to make sense of the consumption and use of genetically modified organisms. Before researching into the various uses of GMOs, I didn’t understand why Americans continue to alter the makeup of foods. I assumed GMOs only negatively impacted society, contributing to overpopulation and animal cruelty. If anything, I have learned that there are multiple perspectives to consider when analyzing a cultural practice. While the use of GMOs might not make sense to an animal activist, it might to doctor or to a human rights advocate. Genetic modification has become a popular practice for a reason. We rely on genetic modification to keep up with growing demands for meat and produce, and to regulate industrial practices. GMOs allow for the fast production of foods at a relatively low cost and have contributed to significant medical advances. Some companies like Monsanto engage in corrupt marketing practices and we have allowed for them to give all GMOs a bad reputation. We can’t lump GMOs together into one category, but should evaluate them on a case-by-case basis. Hopefully, supporters and opponents of genetic modification can learn from each other, and work to settle ethical disputes. GMOs have the potential to better society, but only if we resolve the moral conflicts that surround them. There has always been debate over genetically modified organisms and their role in American culture. The media draws attention to the views of extreme supporters and opponents of genetic modification, further polarizing public opinions. As discussed in the article, “Unearthed: Where Supporters and Opponents Agree on GMOs,” there’s scant common ground between those for and against genetic modification. However, there are a few main points that opponents and supporters have come to agree on. Everyone can agree that GMOs have contributed to the rise of herbicide-resistant weeds and pesticide-resistant insects. This is a concern for both supporters and opponents of GMO use. GMOs have led to the creation of resistant weeds and resistant weeds have given rise to resistant pests. However, GMOs can also simplify weed control and farmers are finding ways to reduce the likelihood of resistance developing. Perhaps more importantly, both supporters and opponents see the value in evaluating GMOs on a case-by-case basis. GMOs tend to get lumped together, making it difficult to determine if some are more problematic or more beneficial than others. Genetically modified organisms have different effects on the environment and can be deployed for societal good or ill. Through this blog, I have come to see the importance in looking at both sides of an argument. As we discussed in class and observed in the article “Fighting for Our Lives,” we live in an argument-driven society, that rests on the assumption that opposition is the best way to solve conflicts. We have extremely polarized views and criticize others to prove ourselves right (Angeloni, 2013: 35). While I didn’t want to believe there were flaws in my original argument against the use of GMOs, I have come understand and even agree with points made by supporters of genetic modification. As a culture, we need to find greater common ground and turn the debate on genetic modification into a discussion. Tamar, Haspel 2013 Unearthed: Where Supporters and Opponents Agree on GMOs. Electronic Document. http://www.washingtonpost.com/lifestyle/food/gmo-common-ground-where-supporters-and-opponents-agree/2013/11/11/b91efcdc-47cc-11e3-bf0c-cebf37c6f484_story.html, accessed December 3, 2013. In anthropology lab, we discussed the concept of a “grapple” or an apple genetically modified to taste like a grape. As a class, we were challenged to determine if a grapple would be considered food to most Americans. Surprisingly, I was one of few students who believed a grapple is in fact, an American food. I was hoping I could taste a grapple to see for myself if grapples taste like “food” but was disappointed to find that grapples are not sold in local grocery stores. For my own entertainment, I researched further into different types of new and interesting genetically modified food products and tried to determine how they make sense. 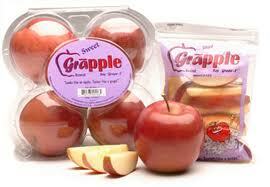 The Grapple: A cross between an apple and a grape. Why it makes sense: The grapple was designed to provide a higher vitamin-C dose per fruit for third world aid. Most of the funding for the fruit came from UNICEF. 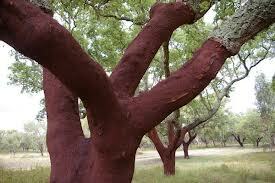 The Rubber Cork Tree: a cross between a rubber tree and a cork tree. Why it makes sense: Wine industries love rubber cork trees. Bark taken from this tree looks like real cork but has the permanence and flavorlessness of rubber. The Paper Tree: A tree that is genetically modified to have leaves with a similar texture and look as paper. 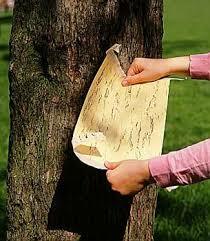 Why it makes sense: The tree grows square leaves that, when dried, can be used as writing paper. This is an environmentally friendly way of producing sheets of paper. Though wacky, some of these new genetically modified organisms are proving beneficial to society. Paper trees, for instance, allow for fewer trees to be cut down and transformed into paper. The grapple is not only unique tasting, but also more nutritional than the typical apple. Science is finding crazy, new ways to use genetic modification for societal good. When you think about the main arguments against the use of GMOs, they are usually centered around the detrimental impacts of genetic modification on human health and the environment. However, GMOs alone do not directly impact society. The way we make GMOs, how we distribute and use them are essential to our understanding of why we promote them. Maybe food activists shouldn’t focus on GMOs in particular, but the variety of cultural factors that shape the way we eat. Sciffman argues that GMOs can be beneficial to society and that Americans devote too much time and energy into trying to combat genetic modification. He describes, instead, the devastating impacts of modern agricultural practices on the environment. The real problem, according to Sciffman, is that we are cutting down the Amazon to grow soybeans and diminishing our groundwater reserves. Whether or not the foods are genetically modified or not is besides the point—we can’t continue to deplete resources and grow more and more to feed a growing population. This reminds me about our discussion in class about Hurricane Katrina and the environmental and cultural factors that contributed to the hurricane’s devastation. It wasn’t one factor or nature alone that was to blame, but a variety of historically entrenched factors and cultural inequalities. Similarly, GMOs can’t be blamed for society’s ills—Americans choose to eat a lot, to eat unhealthily, and to continually deplete resources. It is not GMOs but how we choose to grow and use them that can be problematic. Schiffman, Richard 2013 GMOs Aren’t the Problem. Our Industrial Food System Is. Electronic Document, http://www.theguardian.com/commentisfree/2013/nov/06/genetically-modified-food-safe-monsanto, accessed November 22, 2013. This Friday, I went home for the afternoon so I could get my annual check-up at my doctor’s office. As part of the evaluation, I was asked about my diet and the different types of foods I choose to eat regularly. When I started to list off some food products, I was reminded of this blog and my research on GMOs. Although I didn’t intend to interview my doctor, Amanda Kelley, I ended up asking her a few questions about her opinion on genetic modification. Dr. Kelley described how she has never had a patient who has had a medical problem directly related to the consumption of genetically modified foods. She recommends genetically modified food products to patients but emphasizes the importance of eating foods from all six food groups. Dr. Kelley frequently advises patients to buy rice and cereals that have been genetically modified to contain iron. Dr. Kelley also recommended looking into the medical implications of genetic modification. Inspired by my doctor, I went home and did some research. I discovered that genetically modified microbes and animals have revolutionized the production of pharmaceuticals. The newest hepatitis B vaccines, for instance, are produced using genetically modified baker’s yeast. Similarly, insulin is produced in genetically modified bacteria. Thanks to my trip to the doctor, I now better understand why genetic modification has gained approval in the medical field. As we continue to advance technologically, we have found unique ways to use genetic modification in medicine and experimentation. While I am opposed to the research on animals for our benefit, I see why using GMOs in health-related fields makes sense. If GMOs are already being used to remedy illnesses, they could potentially be used to cure future strains of fatal diseases. Encyclopaedia Britannica. 2013 Genetically Modified Organisms. Electronic Document, <http://www.britannica.com/EBchecked/topic/897705/genetically-modified-organism>, accessed November 22, 2013. The American food industry is shaped by our views about what is or is not food. Unlike other cultures, we view chemically enhanced products as being edible, and generate a demand for these foods to be supplied to the public. There is an increasing need for genetically modified foods as people have come to see these products as an essential part of the American diet. Take meat as an example– some people argue that the consumption of GMOs is promoting animal cruelty in a select few animal species such as cows or pigs. However, American culture has created a high demand for particular meat cuts that can only be fulfilled through the use of genetic modification. Americans do not typically crave the internal body parts of animals such as intestines or liver. We give muscle meat names like steak and pork chop, but do not assign special names to most other body parts. I would be happy if I was told I was about to eat a steak, yet repulsed if I was told I was about to eat a tongue. The meat we choose to consume and the names we assign to food have led us to associate consuming innards with being less human or cannibalistic (Delaney, 2011: 271). American cuisine thus consists largely of meat, but only meat from certain parts of a few animal species. In order to feed an ever-growing population, American industries need to invest in genetic modification, allowing for the production of popular sources of protein at a fast pace. In this regard, genetic modification makes sense. We are culturally-wired to desire some foods more than others. Genetic modification has provided us with a simple, fast way to make more of the foods we like. What’s unique about the topic of genetic modification is that it is common in my own culture. Eating, like every daily ritual I perform, from brushing my teeth to taking a shower, is not something that I think too much about. It’s hard to maintain cultural relativism when what you do has become habit. However, when I do take time to think about what I am eating and why, I feel uncomfortable. A few years ago, I watched the movie Food Inc. which showed disturbing images of suffering, sickly animals being killed in slaughter houses and sold in American markets. After viewing the film, I decided I was going to become a vegetarian to take a stand against animal cruelty. Unfortunately, my vegetarian-kick only lasted a few weeks. I found it nearly impossible to maintain a healthy, balanced diet without consuming meat. The American economy is heavily reliant on genetically modified meat products and chemically composed junk food. Why is it that we continue to eat this way despite criticism from other cultures, and our reputation for being unhealthy, “fat” Americans? In future blog posts, I hope to focus more on trying to understand why genetic modification makes sense for our culture. kgurnari on Why Consider GMOs?